Ontworpen voor gebruik in ruwe industriële omgevingen kunt u met deze USB 3.0 hub uw connectiviteitsopties uitbreiden door zeven externe USB 3.0 poorten aan uw computer toe te voegen. Nu kunt u uw dagelijkse productiviteit verhogen door krachtige en gemakkelijke toegang tot uw externe harde schijven, printers, mobiele apparaten en andere randapparatuur. Ontworpen voor prestatie en duurzaamheid heeft deze industriële hub een robuuste, metalen behuizing. De veelzijdige klemmenblokingang van 7-48 VDC biedt u flexibele voedingsopties voor de hub, op basis van uw eigen ingangsvoedingsbron. Bovendien wordt een uitgebreid bedrijfstemperatuurbereik (0 °C tot 70 °C) ondersteund, en dus betrouwbare prestaties zelfs in veeleisende fabrieks- en industriële omgevingen. De robuuste hub biedt ook ESD bescherming voor elke USB-poort, waardoor uw investeringen worden beschermd door schade aan uw aangesloten apparaten te voorkomen. Deze op een wand te monteren USB 3.0 hub kan veilig worden gemonteerd op oppervlakken, onder bureaubladen en op andere drukke plaatsen waar het risico bestaat dat USB-verbindingen los kunnen raken. Ook worden optionele DIN-railmontagesteunen meegeleverd voor de installatie in apparatuur-racks. Deze industriële hub is compatibel met SuperSpeed USB 3.0 en ondersteunt een bandbreedte van 5 Gbps Hij is ook neerwaarts compatibel met USB 2.0 en 1.x specificaties, en ondersteunt bovendien oudere USB-randapparaten of oudere systemen zonder USB 3.0. De ST7300USBME wordt gedekt door een 2-jarige garantie en gratis levenslange technische ondersteuning van StarTech.com. Geen bijkomende drivers of software nodig. When can I use a USB hub without a power adapter and what difference does it make? It is possible to use some USB hubs without a power supply, however, doing so may prevent certain high-power USB peripherals from operating. When a power adapter is not used on a hub that comes with a power adapter, power is drawn from the USB port on the computer and then divided between the ports on the hub. This reduces the power delivery to individual ports and high-powered USB peripherals, such as external hard drives, may not start. On USB hubs that can use a power adapter, more power can be supplied to USB ports than what is possible with a single USB port. If your USB peripherals require power adapters, they probably do not require power from the USB port and can be used on a USB hub without a power adapter. With USB peripherals that use power adapters, the USB ports on the hub are only used for data transfer and do not draw power from the hub. USB peripherals that require low power (for example, keyboards and mice) can be used on hubs without a power adapter, in conjunction with other low-power USB peripherals. In this case, power is drawn from the computer's USB port, as described above. 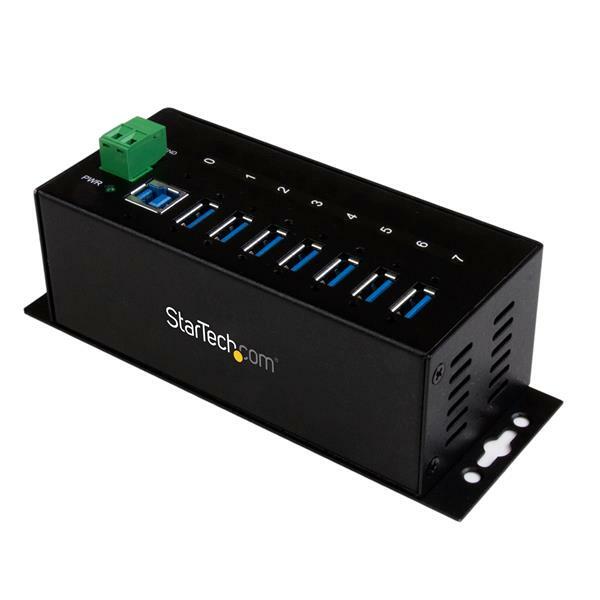 How do I provide external power to my industrial USB hub? 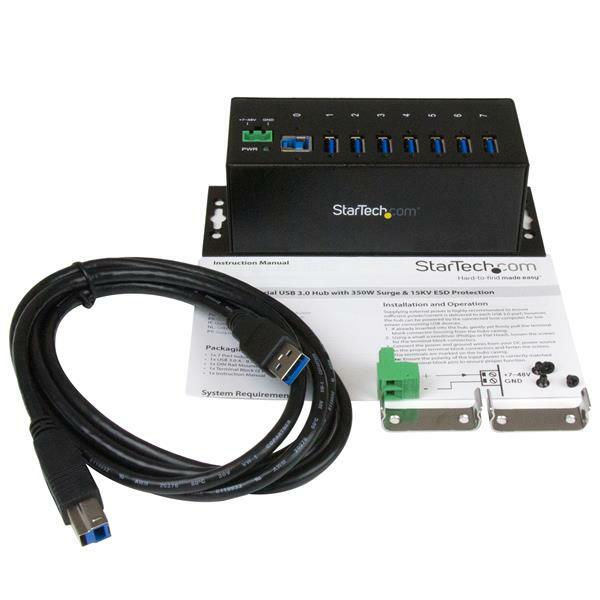 Industrial USB hubs offered by StarTech.com require an external power supply that connects to the terminal block on the hub. StarTech.com does not sell power supplies for these hubs and a power supply must be provisioned separately. To select a power supply, you need to determine the maximum power requirements (wattage) of the hub. P is the power in watts. 5 is the voltage of the USB port. I is the current of the USB port in Amps. I = 0.5 A for USB 2.0. I = 0.9 A for USB 3.0. N is the number of USB ports. For example, a four-port USB 3.0 hub's maximum power requirement is P = 5 * 0.9 * 4. Therefore, the minimum wattage of the power supply for the four-port USB 3.0 hub is 18 watts. 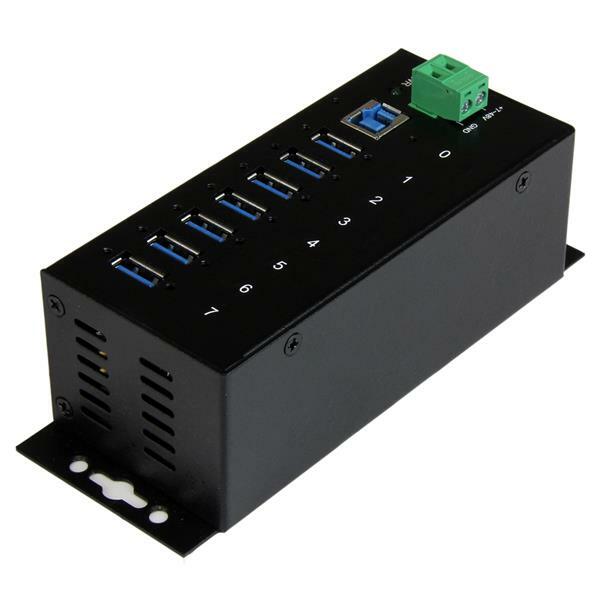 The voltage must be within 7 to 24 or 7 to 40 Volts DC, depending on the specifications of the USB hub. The power supply must convert AC to DC (no AC output). The power rating is equal or greater to the requirements of the hub. I is the current of the power supply. P is the calculated power of the hub. V is the chosen voltage of the power supply (between 7 to 24 or 7 to 40 volts). For example, if a hub requires 18 W and you choose a 12 V power supply, the current of the power supply would be I = 18/12, I = 1.5A. Power supplies are sold by a number of online distributors and resellers. StarTech.com does not provide any official recommendations for distributors or resellers. Use the USB cable and USB peripheral(s) in another setup to see if the problem is with the components or the setup. Use a different USB cable, USB port, and USB peripheral in your setup to see if the problem persists. Ideally, you should test a component that you know works in another setup. If a power adapter is included, provide power to the USB hub. Attach a USB peripheral. The USB hub will not appear in any hardware listings on your system, but USB devices do appear when they are connected. Install the drivers for the USB peripheral. Install the latest drivers for the USB controller and motherboard chipset. Note: No drivers or software are required for the USB hub to work with your operating system. 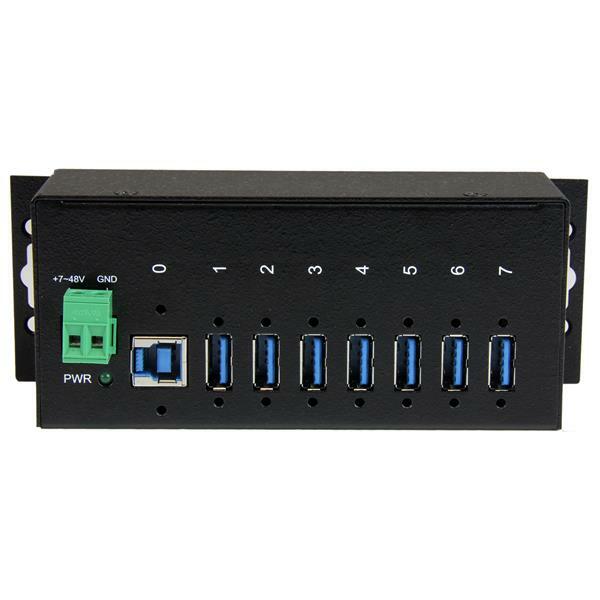 The USB hub works independently of software and works with any operating system. If required, attach external power. Confirm that the peripheral works on a standard USB port. Use a new USB A-to-B cable. Test your setup using basic USB peripherals, such as a keyboard or mouse. Test using another USB port.